Stanford’s pilot partnership with UVote, a voter registration program created at Northwestern University, registered 786 students and faculty to vote this year. The California voter registration deadline passed on Oct. 22. The new voter registration program replaced less centralized student group efforts from past years, but did not register as many voters. According to Lindsay Lamont ’13, president of the Stanford Democrats, one of the most effective methods used in past years was having “dorm captains” in each residence responsible for asking students if they were registered to vote. Lamont estimates that approximately 1,000 students registered to vote in each of the 2008 and 2010 election seasons. Sixty-six percent of new voters at Stanford this year registered to vote in California. UVote staff also helped out-of-state students fill out absentee ballot requests and mailed these forms when possible. Tom Schnaubelt, executive director of the Haas Center, was approached by the Northwestern University’s Center for Civic Engagement about the possibility of launching UVote at Stanford. Schnaubelt agreed after hearing about the program’s success rate at Northwestern, where 90 percent of the incoming freshman class registered to vote in the program’s pilot year. At Northwestern, every freshman had to go through a UVote station during university registration. UVote volunteers at Stanford set up tables at the fall activities fair, the Haas Center’s public service open house and in dining halls and near bike registration lines during New Student Orientation to target freshmen. However, only 320 of Stanford’s UVote registrees were freshmen, according to Haas Center executive assistant Maria Fraboni. Along with Northwestern and Stanford, six other colleges partnered with UVote this year. Stanford is the only school on the West Coast to partner with UVote—the other universities are located in Illinois, Virginia and Missouri. 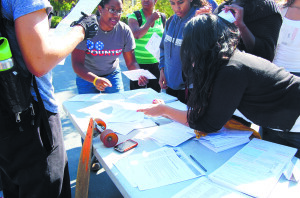 Voter registration at colleges has become increasingly popular as campaigns target young voters. According to the Center for Information and Research and Engagement at Tufts University, there are approximately 11 million college students between the ages of 18 and 24 who can vote in the 2012 presidential election, and 16.8 million young people who were not eligible to vote in the 2008 election can vote this year. According to an Oct. 13 article in The New York Times, more than 60 colleges across the country now offer voter registration programs. Some universities, such as Harvard, use Internet-based programs like TurboVote. Although Stanford’s pilot program with UVote was not as successful as Northwestern’s, Schnaubelt believes his goal of 100 percent registration of the incoming class can be achieved with better planning. The Haas Center and ResEd are currently in discussion about partnering with UVote next year to bring the drive into students’ living spaces. Schnaubelt also has a number of ideas to improve the program. Lamont, who managed a UVote site near bike registration, said that although students were “fairly receptive” to UVote, she is not convinced that Stanford should rely solely on UVote next year.